Nominated for an Academy Award in the Best Foreign Language Film category, this critically acclaimed Danish/Swedish film has so far been unable to pass unnoticed in any country. The engrossing story of a young Princess, Caroline Mathilda (Alicia Vikander) travelling from England to Denmark to marry his majesty Christian VII (Mikkel Boe Folsgaard) is bound to appeal just on the basis of its simplicity, a sense of adventure and romanticism. Although from her childhood years the young Princess often dreamt of her magical encounter with the Prince, in the end everything turns out far from what she had expected. With the King perceived as ‘weak in the head’ and completely childish, Caroline soon becomes infatuated with his right-hand man, a mysterious and liberal-thinking German physician, Johann Friedrich Struensee (Mads Mikkelsen). Together, at the times of repression and injustice, the pair is about to change Denmark beyond all recognition and direct it onto the path of justice and the Enlightenment. Apart from its Academy Award nomination, ‘A Royal Affair’ has also been an absolute star at the recent Berlin International Film Festival, where it swooped a number of awards and was even nominated for the Golden Globe Award in the category of the Best Foreign Language Film 2012. From the film’s first scenes, it is very easy to see why it has been so successful. From its meticulously drafted script and outstanding cinematography to the brilliantly -acted scenes and amazing costumes and decorations, ‘A Royal Affair’ is the very epitome of what a good period drama should stand for. All actors have done an exceptional job here: from a delightful up-and-coming actress Alicia Vikander (“Anna Karenina” (2012)) and a well-known Danish actor, Mads Mikkelsen to a Danish newcomer Mikkel Boe Følsgaard (the King) and the actors playing secondary characters. 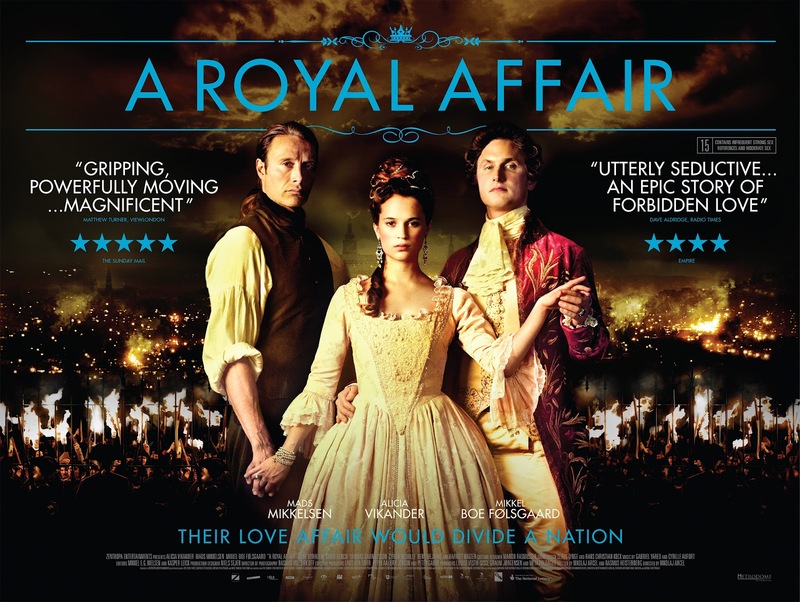 Although ‘A Royal Affair’ shares similar themes with ‘Elizabeth’ (1998) and ‘Shakespeare in Love’ (1998), the film has a very different quality from either of the two, and seems even to be superior to them in a number of important aspects. For example, ‘A Royal Affair’ does not stray from the truthful representation of historical facts. Although running slightly more than two hours, the film is never tiresome, and the narrative is very well-paced. Cleverly balancing funny and sad moments, ‘A Royal Affair’ is watched almost on one breath: the audience is either captivated by the lovely Vikander or by the handsome Mikkelsen or even by the brilliantly capricious Mikkel Boe Følsgaard to pay attention to any slight irregularities. And when these three are not in the frame, the film’s interesting and somewhat unusual portrayal of historical events and a degree of suspense are also sufficient to keep people glued to the screen. The secret to this film’s success also lies in the powerful and memorable portrayal of the main characters: be it the beautiful, talented, headstrong and intelligent Queen, the ‘weak-spirited’, but likeable King-Clown or the rational and charming Physician. The Queen, the King and the Physician seem to stand and represent different ways of looking at the world, but they do have things in common that unite them, for example their passion for reading. On that basis, it is interesting to see the trio’s interactions. For example, Caroline first gets Struensee’s undivided attention when she selects a book of Rousseau from his book shelf and Struensee is able to make first connections with the King by answering his book quotations with his own. ‘A Royal Affair’ is also no ‘The Duchess’ (2008), although both films share a very similar story line. ‘A Royal Affair’ starts off in a similar way to ‘The Duchess’: there is this emerging tyranny of a mad King (the Duke), and there is this pitiful destiny of a young Queen (the Duchess). However, things do not progress further than this in ‘The Duchess’, and we see a wealth of development after this point in ‘A Royal Affair’. To that effect, ‘A Royal Affair’ is a better film.The tension and drama are build-up slowly in ‘A Royal Affair’, but they culminate more effectively and unpredictably in this film than in ‘The Duchess’. Also, unlike in Joe Wright’s new adaptation of ‘Anna Karenina’, in ‘A Royal Affair’ we see a powerful and emotional love story that we can truly believe in, and the chemistry between the main heroine and her love interest is great. As the passion between the young Queen and the Physician develops and grows, so does the danger. The film captures the moments of attraction between the Queen and Physician with the ardent curiosity and interest. This can be compared to the almost unemotional, hasty and blatant love encounters in ‘Anna Karenina’. Great review! Heard some really good things about this but it completely passed me by when it was released. Not the hugest fan of period pieces such as this but I’ll definitely have to give this a go. Thanks! Even if you ain’t into this genre, I don’t think this film can disappoint, so it’s worth a shot. I loved this film, great and accurate review – although I loved the dark emotion and creative embellishment of Anna Karenina. I thought it was just as extraordinary, just a different tone. I look forward to reading more of your reviews! Oh! Okay….you might have been a tough sell (for AK). Lol. I find that is the case for fans of any book going to see a film, there is attitude of he/she is going to mess this up, from get go. And the filmmakers don’t help, because in their lack of care for certain elements of the story, they rush quickly getting rid of it. Something that always works against them. I just saw this movie about a month ago and was pleasantly surprised by how absorbing it is. It’s not your run-of-the-mill period piece, that’s for sure! I’ll be watching it again before long. I am happy you liked it! It is a very well-crafted movie which more people should see! Also, one can also plainly see here Alicia Vikander’s enormous potential as an actress, and that she will go far in her career.